NASA Jet Propulsion Laboratory and Microsoft have developed software called OnSight that will enable scientists to work virtually on Mars with Mars Curiosity rover, using wearable technology called Microsoft HoloLens. OnSight will use real rover data and extend the Curiosity mission’s existing planning tools by creating a 3D simulation of the Martian environment where scientists around the world can meet. Program scientists will be able to examine the rover’s work site from a first-person perspective, plan new activities, and preview the results of their work firsthand. Rover operations previously required scientists to examine 2D Mars imagery on a computer screen, and make inferences about what they are seeing. 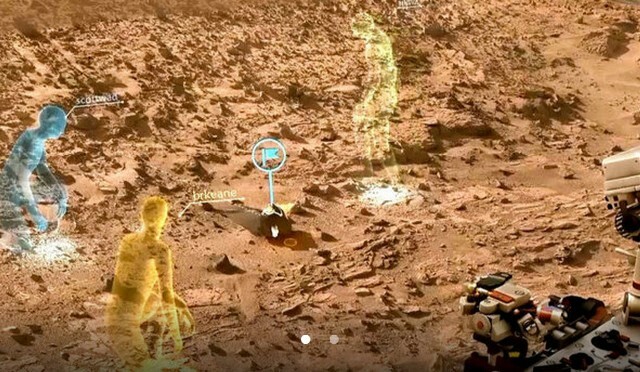 The OnSight system uses what Microsoft calls “holographic computing” to overlay visual information and rover data on the user’s field of view. Holographic computing blends a view of the physical world with computer-generated imagery to create a hybrid of real and virtual. To view this holographic realm, members of the Curiosity mission team don a Microsoft HoloLens device, which surrounds them with images from the rover’s Martian field site. They then can stroll around the rocky surface or crouch down to examine rocky outcrops from different angles. JPL plans to begin testing OnSight in Curiosity mission operations later this year. Future applications may include Mars 2020 rover mission operations and other applications in support of NASA’s journey to Mars.